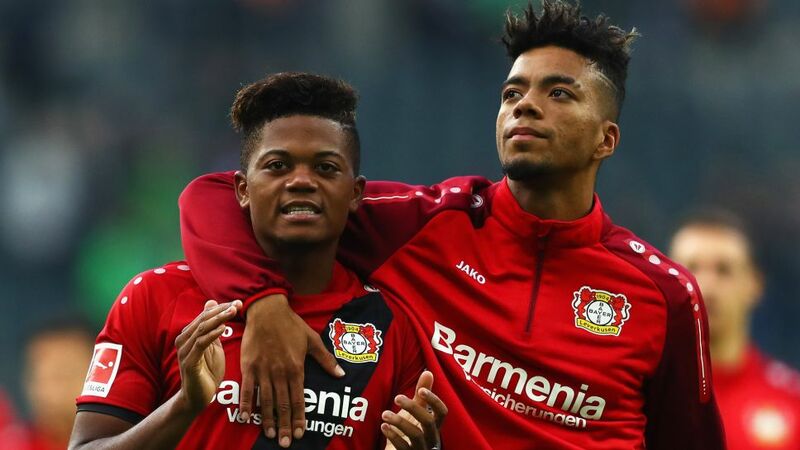 He may be friends with Usain Bolt, have scored the best goal in the 2016/17 UEFA Europa League season and have a thing for fast cars, but ask anyone at Bayer Leverkusen and they will tell you there is more than enough substance to Leon Bailey to go with the glamour. That goes some way to explaining the joy at the BayArena when Die Werkself secured the 20-year-old's signature on a five-year contract on deadline day of the transfer window in January 2017. "In Leon Bailey we have brought in another highly promising player on a long-term deal," said club CEO Michael Schade at the time. "This lad was high up on the wish list of many other European clubs. That makes us even happier to have won out against such strong competition." Head scout Jonas Boldt echoed that view: "We had to act quickly or else we wouldn't have been able to sign him later." The pride Leverkusen’s leaders had after signing Bailey has shown he was worth the effort in bringing to the club. Scoring against Schalke, Borussia Mönchengladbach and in the Rhein-Derby against Cologne in the space of four games in late 2017, Bailey proved he is a player for the biggest of stages. He then followed up those performances with a sensational display at Hoffenheim in January 2018, in which he scored a goal for the Bundesliga ages by bamboozling the entire defence with a backheeled goal from ten yards. It appears the only way is up for Bailey, but just who is the friend of the fastest man ever seen, who was seemingly always destined for the top? Following spells in Austria with USK Anif and in Slovakia with FK AS Trencin, the left-footed attacker arrived at Belgian top-flight outfit Genk alongside his brother Kyle Butler at the start of 2015/16. Aged 18 at the time, he was given a chance in the first team and has not looked back since. Bailey enjoyed an astonishing breakthrough campaign, registering four goals and seven assists in Belgium's Jupiler Pro League en route to winning the Young Professional Player of the Year award at the end of the season. He then proved he was no one-hit wonder the following year, scoring four and providing another two assists in the 2016/17 UEFA Europa League group phase, earning him a place in the official Team of the Group Stage. One of his goals – the opener in a 3-2 defeat away to Rapid Vienna on 15 September 2016 – was later voted Goal of the Competition. That strike, a curling 25-yard shot into the top-left corner, received effusive praise from UEFA's technical panel that included Sir Alex Ferguson, Dejan Stankovic and Ioan Lupescu. They singled out his effort for its "high degree of difficulty of execution in this exceptional first-time strike that was both from distance and on the run." Leverkusen came calling shortly afterwards and Bailey did not need long to make up his mind: "I would like to express my thanks to Bayer Leverkusen for believing in me enough to give me this opportunity I will ensure that I wear the jersey with honour and pride," he wrote on Instagram. Although he only made eight substitute appearances in the second half of the 2016/17 Bundesliga season, the club's plan was always to give the winger time to settle. "We bought him with an eye on 2017/18," said sporting director Rudi Völler. "He's made a good impression so far and strengthens the competition for places out wide. He's an unusually quick, very tricky player who will give our attack an additional boost. We're sure Leon Bailey will be a big hit for us." Quiz: How well do you know Bayer Leverkusen? Take the test! The signs so far this season have confirmed Völler's convictions. With eight goals - including a majestic backheel against Hoffenheim - and six assists in 17 league games, the speed demon, whose dynamite dribbles turn defenders dizzy, has become one of Die Werkself's deadliest weapons. Bailey's key strengths are his dribbling, vision, powerful shot and blistering pace – the latter a trait he shares with one illustrious compatriot in particular: Usain Bolt. "I know Usain very well, he is a close friend of mine and a really cool guy, who travels a lot in Germany," Bailey said in February. "Hopefully we can meet here, maybe I'll call him and invite him to a game in the BayArena." Whether or not the eight-time Olympic gold medalist is able to fit in a trip to Leverkusen remains to be seen, but if he does, he will witness Bailey wowing Werkself fans with his wily wing wizardry, and vindicating his club's efforts to sign a player with superstar potential.